A look at Ravi Varma’s diary and its business-like entries is a testimony to the kind of popularity and supposed fortune that Varma might have accumulated. Many painters wanted to and many were forced to copy his style of portraiture, almost like a cult phenomenon. The portraits in this series are an example of the painters copying the treatment of art by Varma. The light on the face accentuating the features, the dark background, the proportions in the features and the similarity of expression are all nostalgic of Varma’s style- beautifully imitated. Even the postures were similar to the ones which Varma had already used for his compositions. 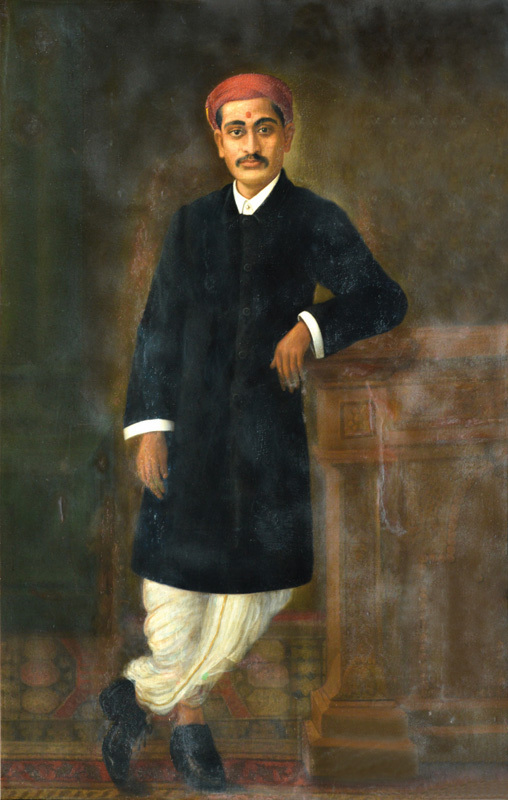 Ravi Varma, stayed in Ahmedabad – Gujarat for a long time and spent considerable time at the Hutheesing-ni-Vadi (Indian style mansion with courtyards). Post his departure from Ahmedabad, there might have arose a need to paint portraits like his and thus many artists attempted to do so for wealthy merchants. This portrait, most probably, of an Ahmedabad based merchant has the direct influence of Varma’s style in it. It is of the same time that Ravi Varma visited the city.